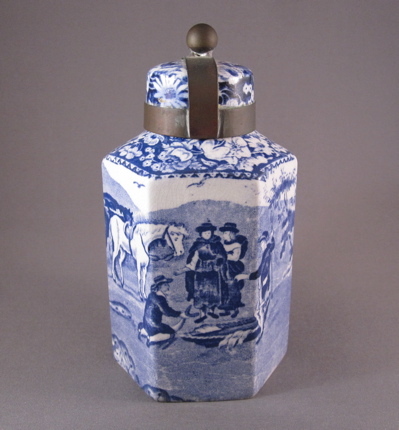 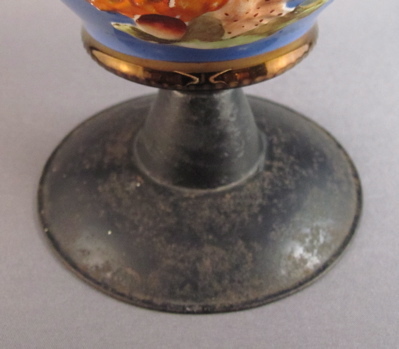 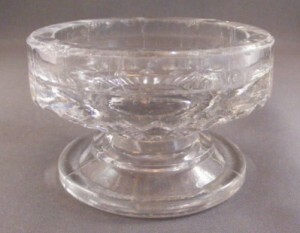 An example of an EAPG (Early American Pattern Glass) master salt cellar in the “Bull’s Eye” pattern, made of flint glass in the mid-late nineteenth century. 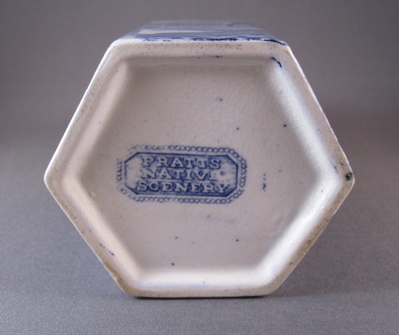 This small piece was made in America and measures 3″ high and is 3″ wide. It lost its original glass pedestal base most likely in the late 1800’s. 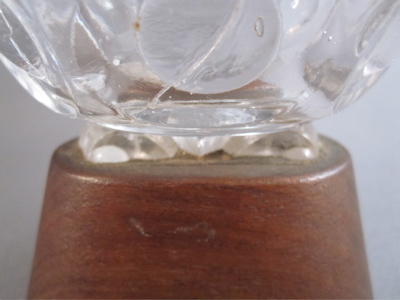 The salt can be passed around the table again, as a crafty person has fashioned a new replacement base from a simple piece of wood. 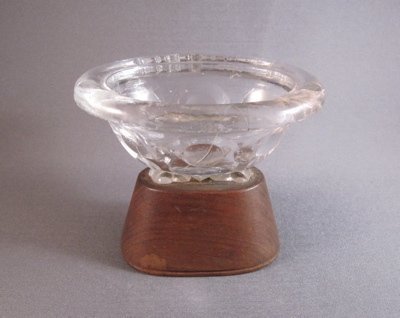 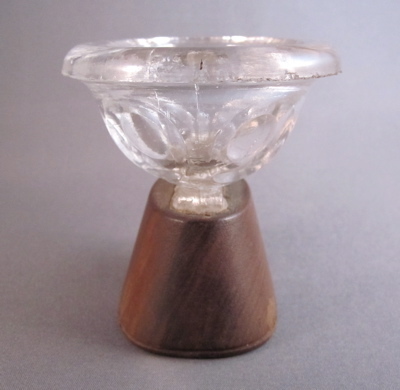 This is another example of a flint glass master salt cellar, showing its original pedestal base. 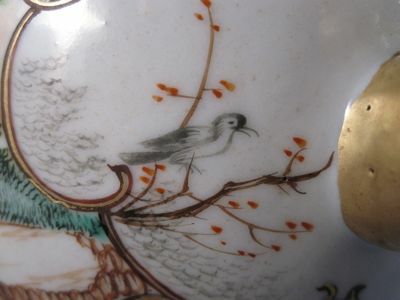 Chinese export pear shaped porcelain jug with sparrow beak from the mid-1700’s with multi color enamel decoration in the Mandarin style, stands 4″ tall. 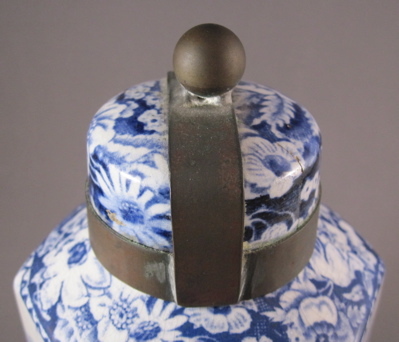 Blue painted metal replacement handle and LOTS of strapwork guarantee many years of use, after the more delicate original handle broke off. 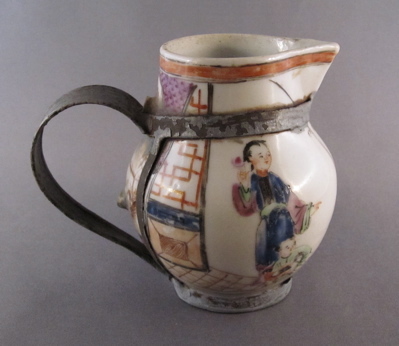 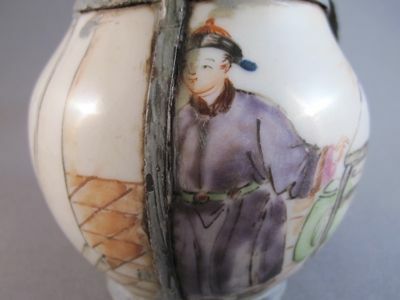 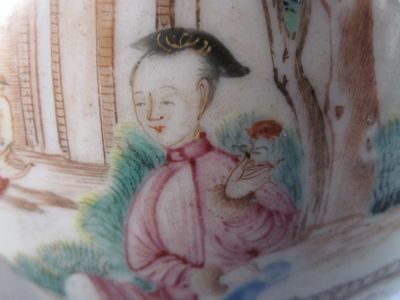 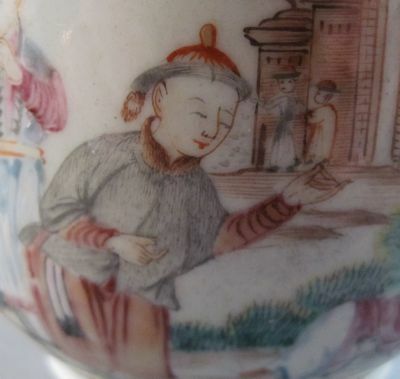 This Chinese porcelain jug with similar form and decoration shows what the original handle on my jug might have looked like. 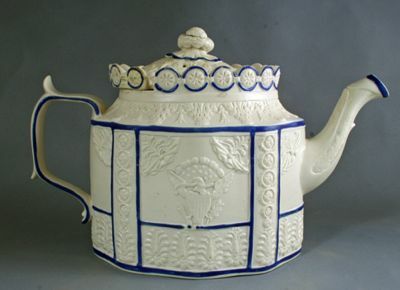 Iconic white feldspathic stoneware 4-3/4″ high teapot from Castleford, England, has neoclassical relief and applied decoration with blue enamel detail. 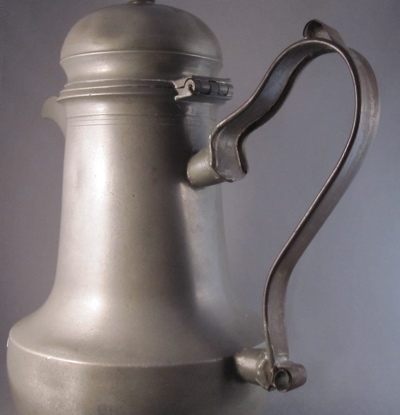 Originally designed by Dunderdale & Co. in 1800, many manufactures in the same region made their own version inspired by the original. 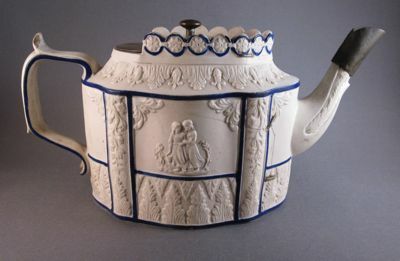 This teapot has survived 200 years of despair and repair. 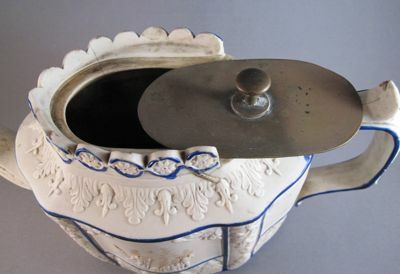 The unique sliding lid, which had the same scalloped edge detail as the pot, seems to have slid off on to the floor and has been replaced by a brass lid, some time in the mid-1800’s. 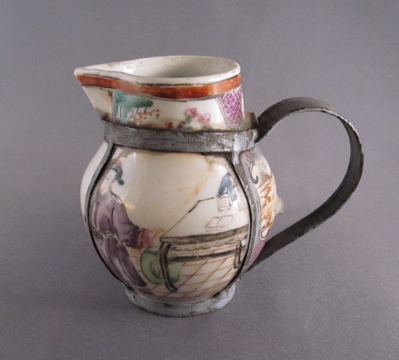 The tip of the spout was also damaged and a metal sleeve now covers the broken spout. 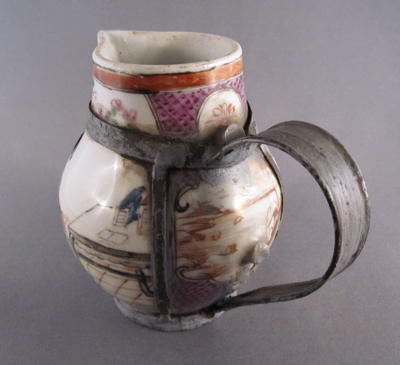 There are even a few staples holding a crack together, making this an unusual example of an item with three inventive repairs made from three different materials. 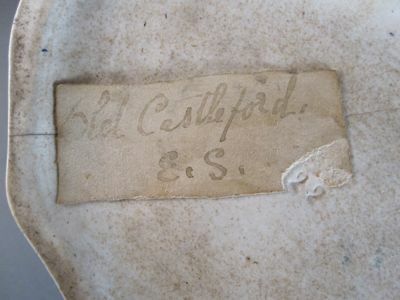 An early paper label and an incised “22” are mark found on the bottom. 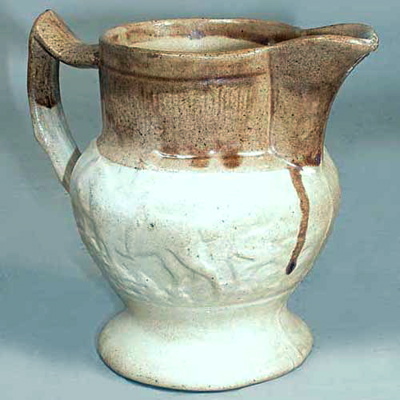 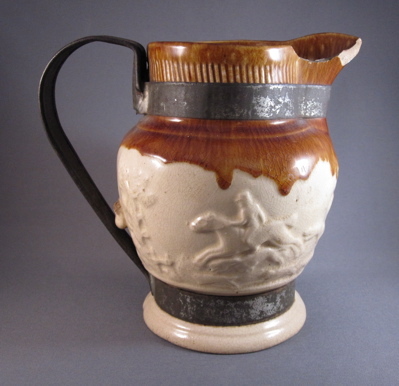 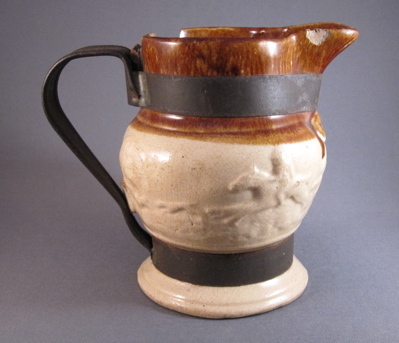 This example with eagle decoration and made for the American market maintains its original lid and spout. 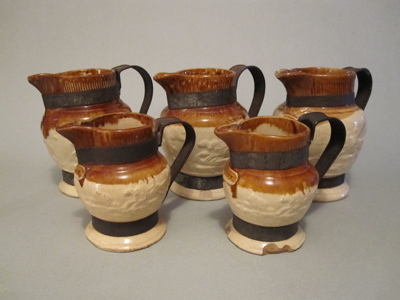 This is the holy grail of antiques with inventive repairs…a set of five matching two-tone salt glazed stoneware jugs with matching replaced tin handles! 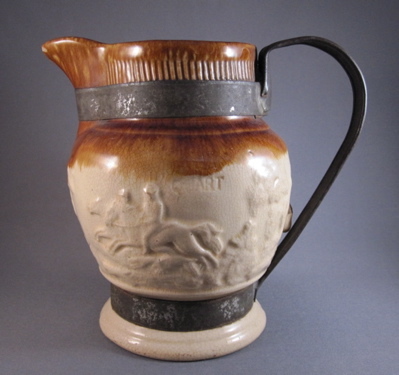 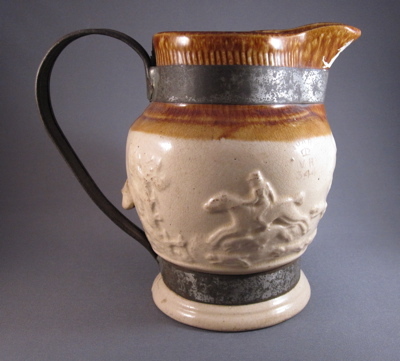 Each jug has a fox hunt scene in relief; the three larger jugs are marked “QUART” and the two smaller ones have “PINT” incised on the front. 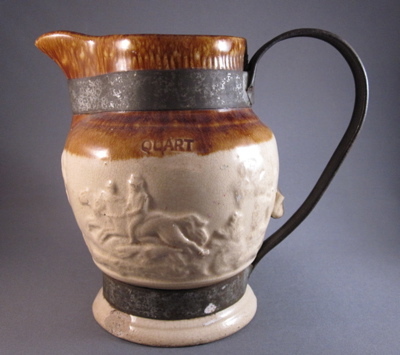 They were made in Lambeth (now known as Waterloo), a borough within London, England. 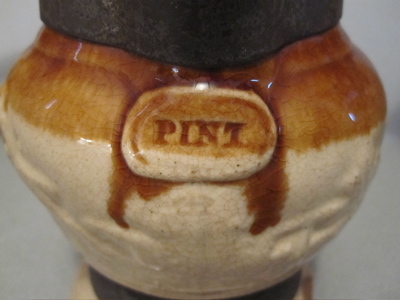 I purchased the set from a dealer in New Jersey who loved them as much as I do. 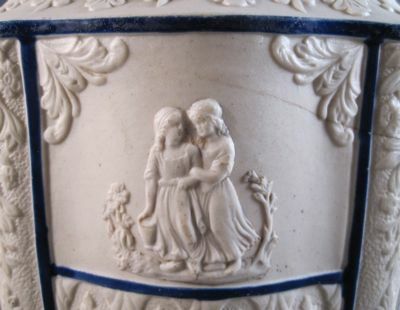 It took a couple of visits and a little bit of coaxing to convince her to sell them to me, as I assured her they were going to a good home. 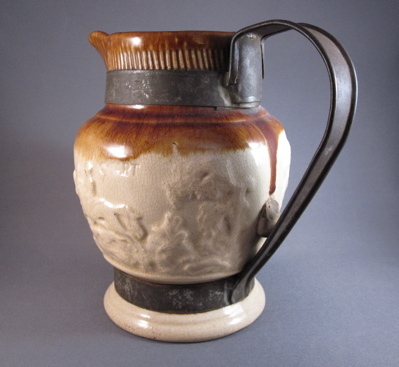 These three jugs are quart-sized and measure 7″ tall. 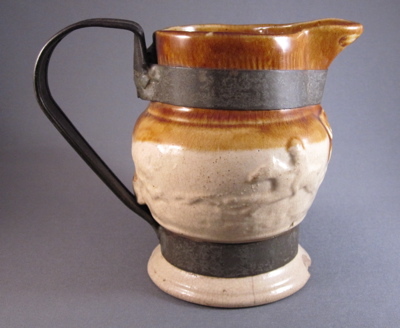 And these two jugs are pint-sized and are 5-1/4″ tall. 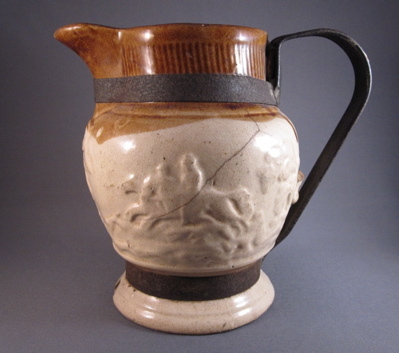 All jugs have replaced handles with two straps made from tin, as well as multiple cracks and chips. 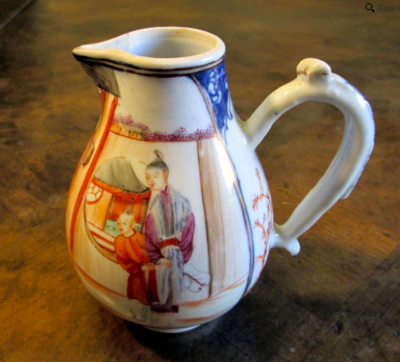 If these jugs could talk I am sure they would tell colorful tales of life in an 19th century English pub! 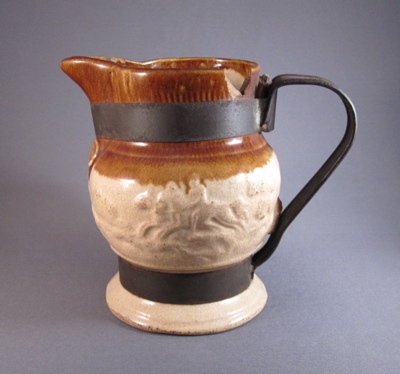 This is what a Lambeth jug looks like with its handle intact. 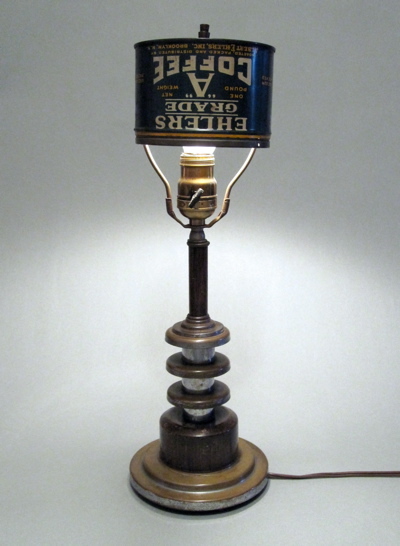 I love this American “machine age” metal lamp, found at a newly opened antiques shop in upstate NY. 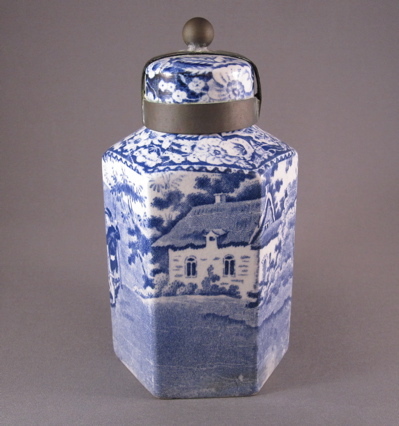 It sits on a side table in my bedroom and is one of the few pieces from my collection that I use often. 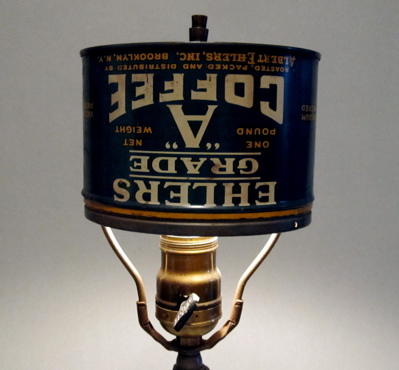 The lamp dates from the late 1920’s and measures 18″ tall. 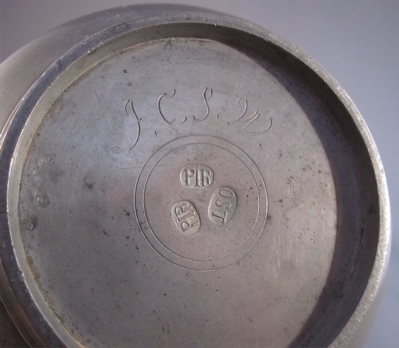 The coffee tin with key wind lid is dated 1938. 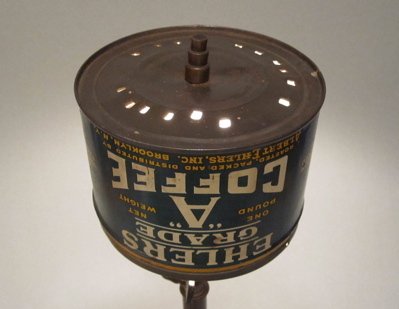 A truly inventive solution to recycling a discarded coffee can and replacing a damaged lampshade all at once. 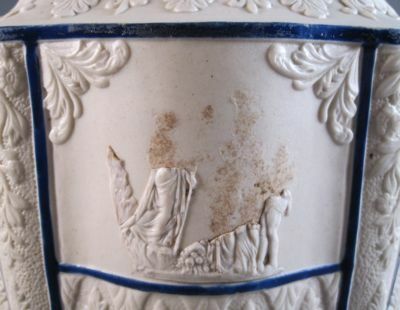 The pierced top of the “shade” allows the heat from the bulb to escape, as well as cast a lovely pattern on the ceiling. 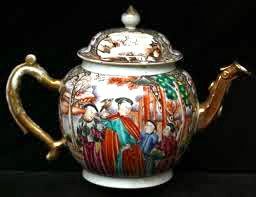 Globular shaped Chinese export porcelain teapot has finely painted enamel and gilt “Mandarin” decoration. 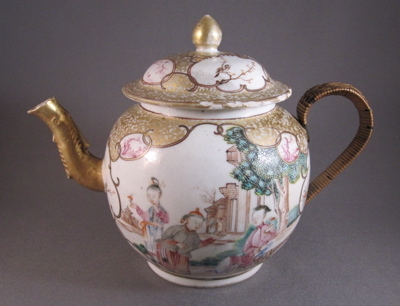 Both sides of the teapot have exquisitely detailed figures painted in the famille rose palette. 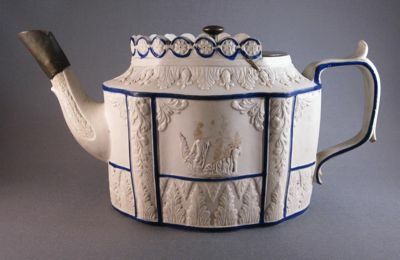 Teapot measures 5-1/2″ to the top of the lid. 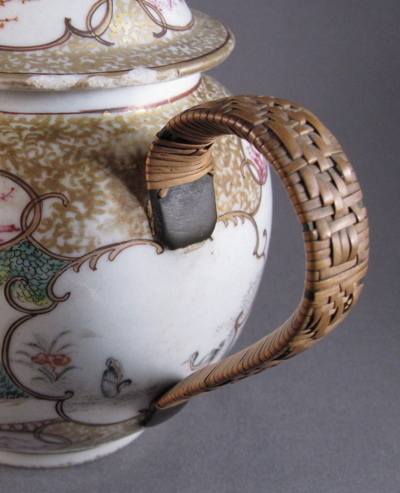 The nicely woven rattan covered bronze handle is a replacement, fabricated in the late 18th to early 19th century. 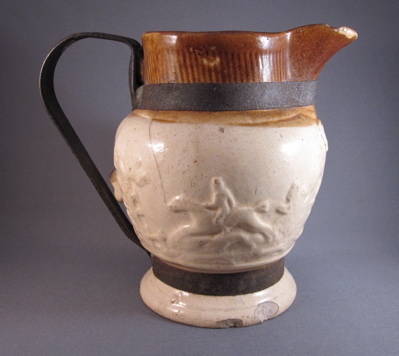 This teapot with similar shape body and spout shows what the original handle might have looked like. 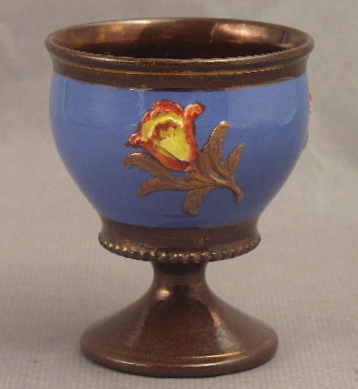 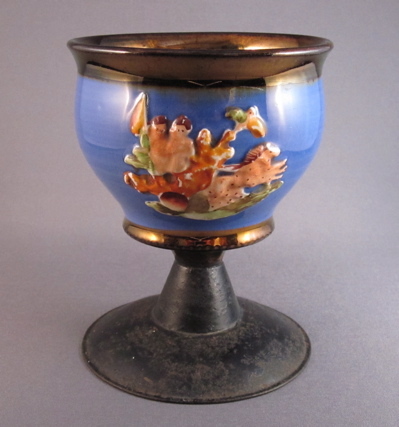 Molded copper lustre goblet with classical relief design of figures in a chariot, measures 5″ high and dates from the mid-1800’s. 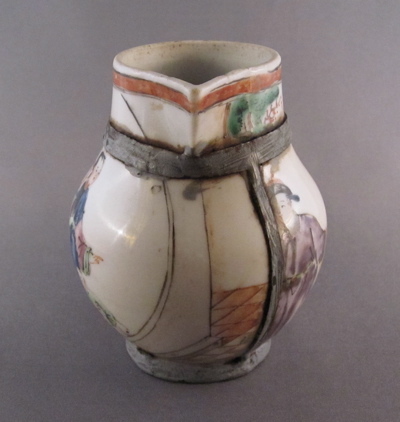 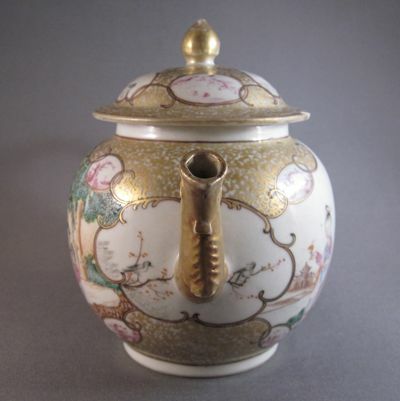 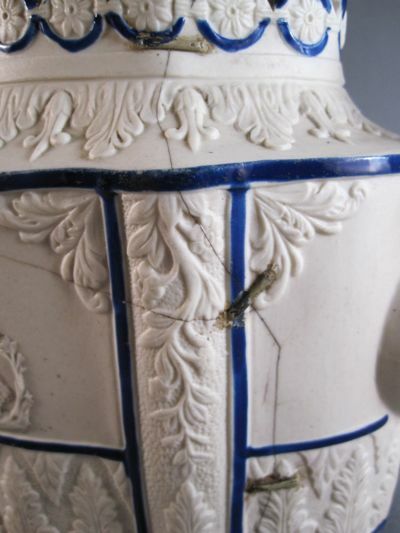 Due to the proliferation of lustreware in England, coupled with the fragile nature of the clay, it is not uncommon to see inventive repairs on pieces such as this. 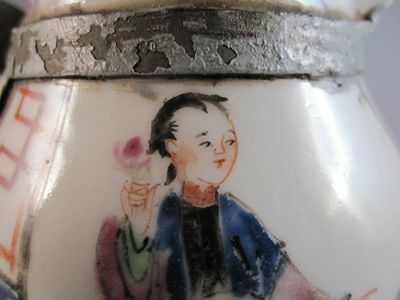 A detail of the child-like enamel decoration and the heavy “witch’s hat” shaped black-painted iron replacement base. 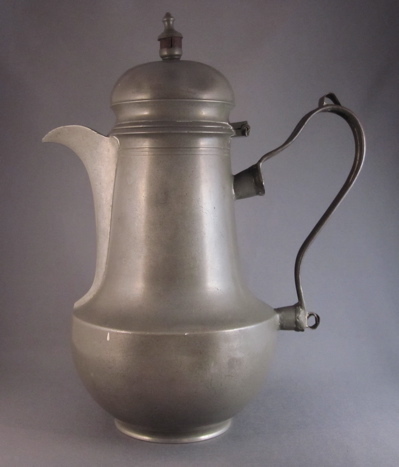 I have not come across many examples of pewter with inventive repairs so I was glad to have found this 11″ tall urn shaped coffee pot. 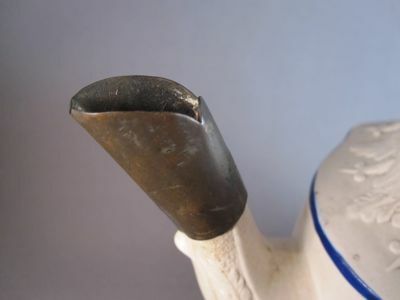 A metal replacement handle with thumb rest and crimped edges has the same silhouette as the original handle, which would have been carved out of wood. 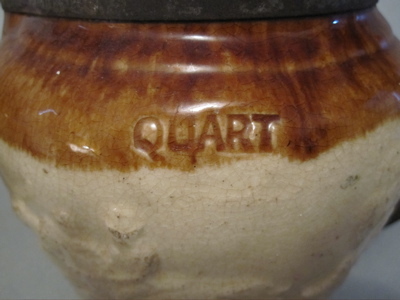 A Continental maker’s marks on the bottom confirms the piece is neither American nor English. 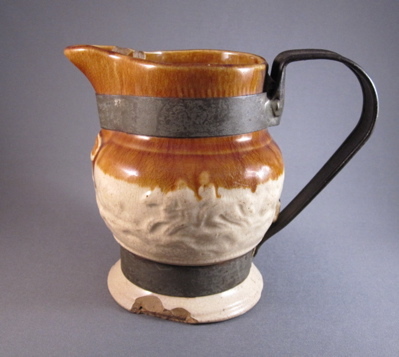 This Federal period coffee pot from Philadelphia maintains its original handle.